An ex-detective with autobiographical memory helps solve a murder with her old boyfriend. 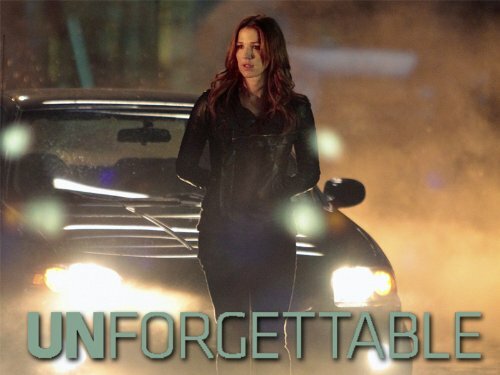 (S0101) When I first heard the premise for Unforgettable, I was intrigued. As a trivia enthusiast, I am fascinated by people with amazing memories. I was even more pleased when I found out that this show was using actual people with autobiographical memory as consultants. The biggest problem with a show like this is that they often make up facts that aren't really true and it all seems fake. The second thing that impressed me about the show was the awesome cast. Sure, Poppy Montgomery is easy on the eyes but Dylan Walsh is the one to watch. He gets to play a very different character than he did on Nip/Tuck. I also adore Kevin Rankin as he is one of the most underrated actors on TV. I could have done without the history between Carrie and Al. The show is interesting enough without having some artificial sexual tension and harbored resentment. It also seems like a lazy way to get her involved in police work. I just hope Al doesn't call her to “help out” on every case. It was pretty interesting to see how the perfect memory thing works. It's one thing to remember everything you see, it's another to understand what your memories mean, if anything. I hope, in the future, Carrie's trips down memory lane are a little less involved, but otherwise, I am impressed with the way it's done. The sister storyline is also something I can do without. We all have baggage but to make Carrie's past such a major part of the series sets up a lot of cheesy episodes. I am not looking forward to the episode where a suspect surprisingly ends up being a part of the sister's death. Maybe I watch too much TV, but it was pretty clear who the real murderer was given all the fake outs, but what was more evident was the fact that Carrie's confrontation the real killer was a tremendously bad idea. She couldn't have waited a while for Al to call her back? All in all, I like this show and will continue to watch as long as I don't have to see anymore ham-fisted scenes about memory like the one with Carrie's Mom in the home.